The A.J. Beatty and Sons Glass Company was in business in the United States from 1852 to 1892. Joseph Beatty and Edward Stillman started a glass factory in Steubenville in 1845. Their Beatty Glass Works produced fine tableware, many in opalescent colors, and tumblers. Joseph Beatty's younger brother, Alexander J. Beatty, bought the plant in 1852 and stepped up production until 160 glass workers were employed producing 36,000 tumblers a day, according to Doyle's "History of Steubenville and Jefferson County," published in 1910. At Alexander Beatty's tragic death as the result of a train accident in 1875, his sons Robert J., George, and daughter, Mary Gill Beatty, inherited the ownership of the thriving business. TIFFIN, OHIO Competition soon came from other areas of Ohio which were able to offer incentives to manufacturing companies to move to their area. In 1887, the city fathers of Tiffin, Ohio, offered $35,000 in cash, land valued at $15,000, and five years of free natural gas if the Beatty Flint Glass Works would move their factory there. Tiffin was also on the Pennsylvania and Baltimore and Ohio trunk lines which facilitated shipment of manufactured products. On the same date, the Seneca Advertiser of Tiffin announced that a contract between A. J. Beatty and Sons and the City of Tiffin was signed and sealed, securing the "famous Flint Glass Works" of Steubenville. The new factory required a streetcar line as well as houses for employees. "One hundred dwelling houses should be erected immediately for the skilled glass workers coming from Steubenville." 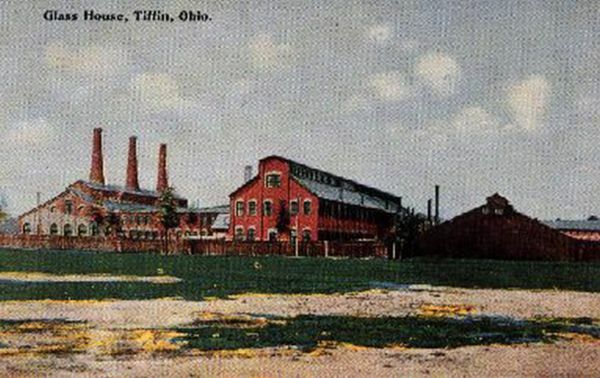 On August 10, 1888, the Tiffin Daily Tribune appealed for 200 houses to be erected at once by the "monied men" of Tiffin before the factory opened. On April 12, 1889, it was announced that A. J. Beatty and Sons, "the finest and most complete glass works in the world" was ready March 1, 1889, but the lack of housing for the glass workers postponed their move from Steubenville. When the Beatty Glass Factory opened in August 1889, a full force of glass makers were employed making pressed and blown glass, with 500 expected to be working within one year. Much of the glass was colored or finely tinted opalescent with artistic designs engraved on special pieces. The output of the factory included tumblers, beer and wine glasses and fancy bottles. In August 1889, the Pittsburgh Glassware Reporter referred to the new flint glass factory of A. J. Beatty and Sons as being "undoubtedly the most perfect and complete of its kind in the United States, as well as the largest of its kind." Today, collectors usually refer to the production from the Tiffin factory as Tiffin Glass (not to be confused with the other Tiffin Glass Company which made collectible figurines). UNITED STATES GLASS The United States Glass Company of Pittsburgh absorbed eighteen glass factories in 1892. Beatty's new Tiffin factory became part of the much larger organization. A. J. Beatty a Sons became known as Factory "R." Commercial production was marked with the letters USG within a gold shield. The early Beatty glass was not marked. After 1927, glass was marked with a gold paper label with Tiffin within. Robert Beatty died in Columbus in 1914 and George Beatty died 2 years later in Columbus. Compiled by GLGD Members; Date: 07/12/10The A.J. Beatty and Sons Glass Company was in business in the United States from 1852 to 1892.